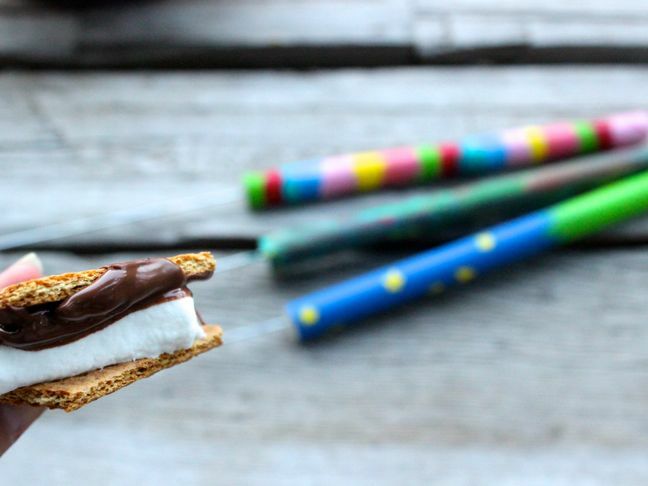 My family loves the gooey, chocolate-y treat squished between two graham crackers, otherwise known as a s’more. 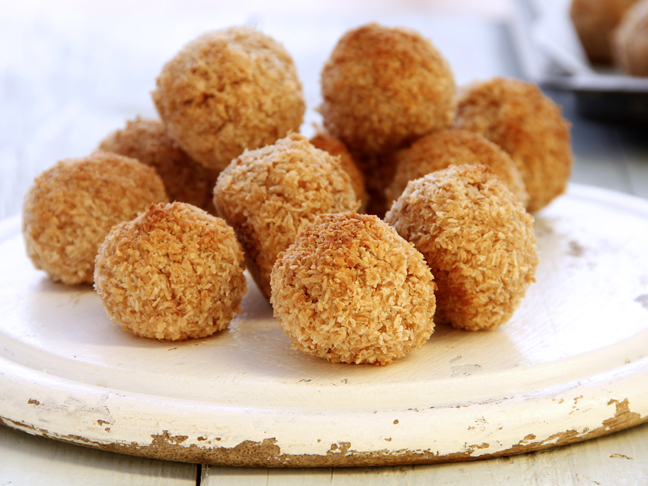 It’s a favorite treat year-round. However, now that fall is in the air, we really like to light up the fire pit and make memories (and s’mores) by the fire. 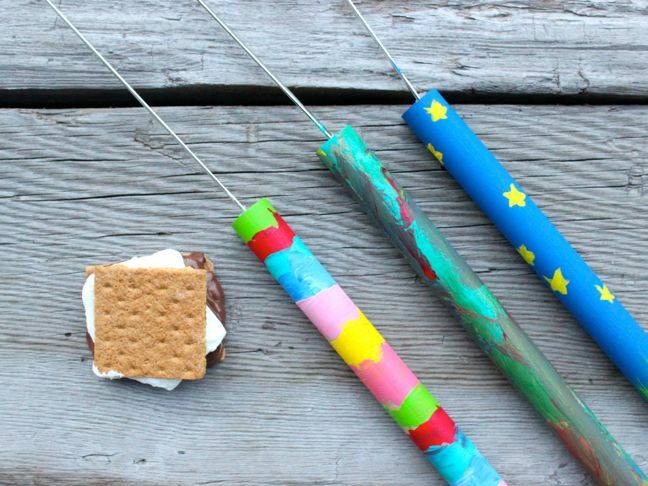 Traditional skewers used to roast marshmallows are great, but I thought they needed a face lift, and a little more color! 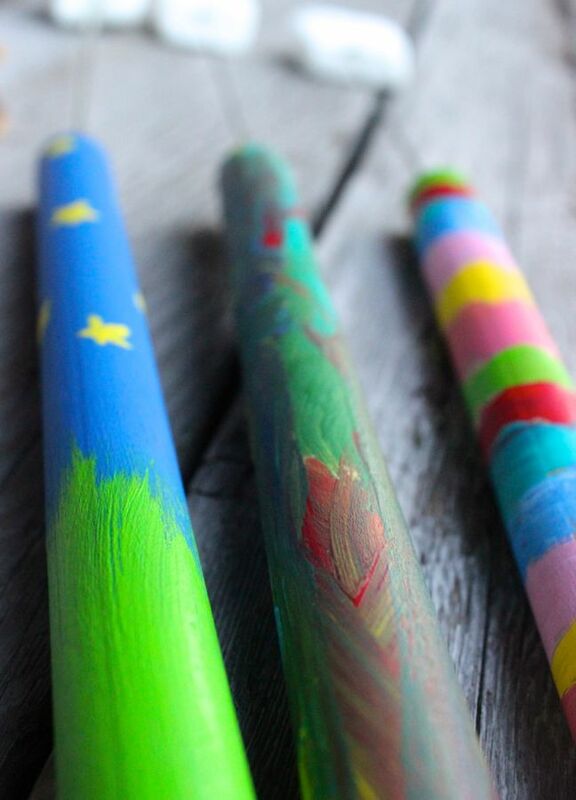 Well, just give my kids a paintbrush and paint, and anything and everything will have a lot more color! 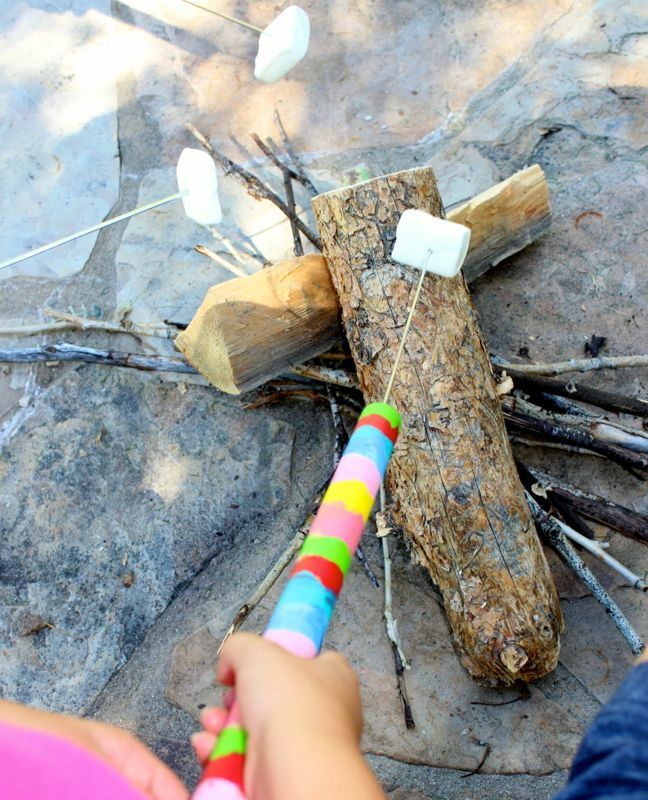 We recently spent an afternoon outside making DIY marshmallow roasting sticks to help us make our favorite all-American treat. 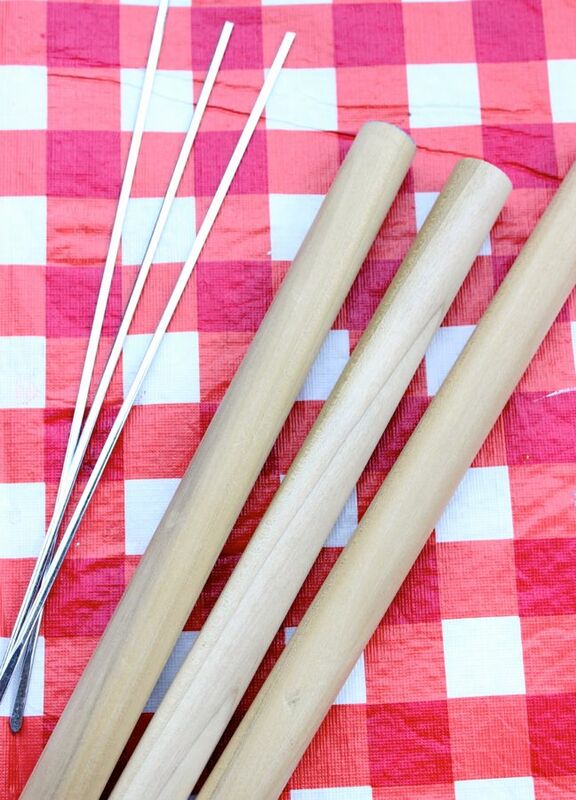 Now everyone has a “roasting stick” to call his/her own. Here’s how we did it. 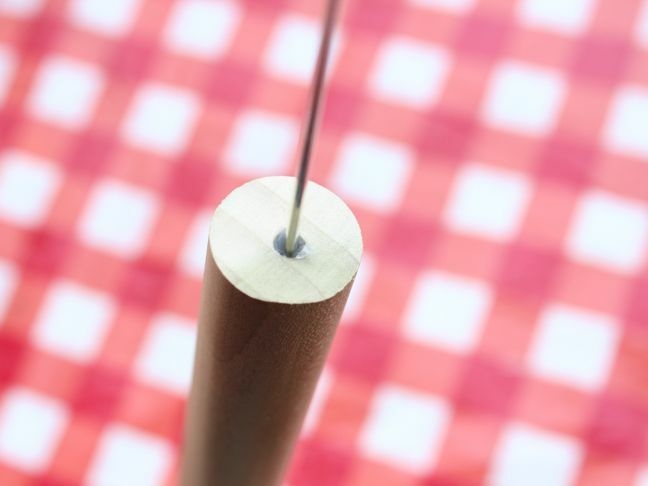 Step 1: Cut the dowel in half, or in thirds, depending on the length of the stick you want. You may also have to cut the end of the metal skewers with Tin Snips if you can only find the skewers with the loops at the end. I found my skewers at my local grocery store for $3 for three, and it was an easy cut. 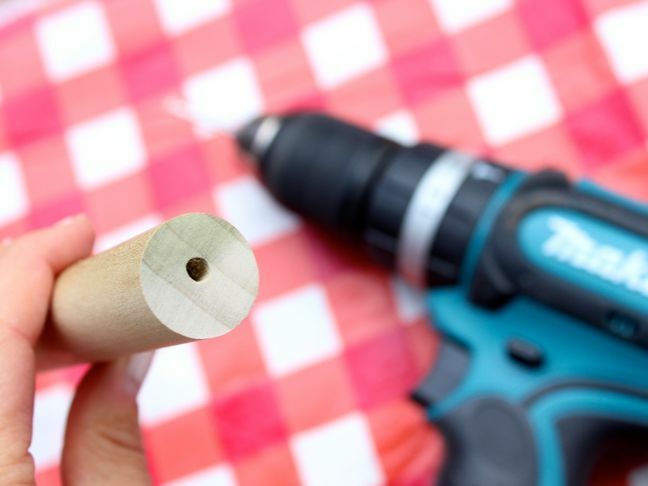 Step 2: Drill a hole on one end, in the center of the dowel. 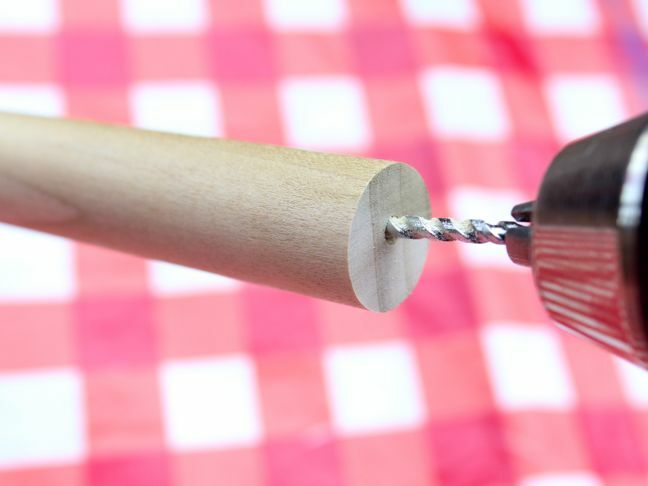 Make sure the hole is large enough to fit your metal skewer. 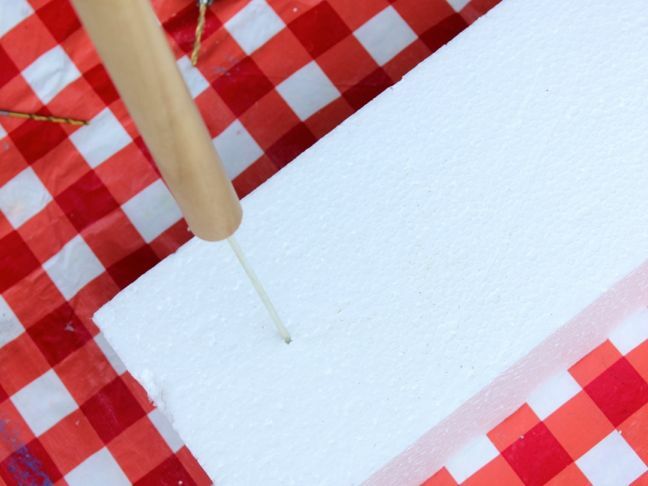 Step 3: Press the hot glue gun into the hole and fill the hole with the hot glue until it fills to the top, then quickly press the skewer into the hole. 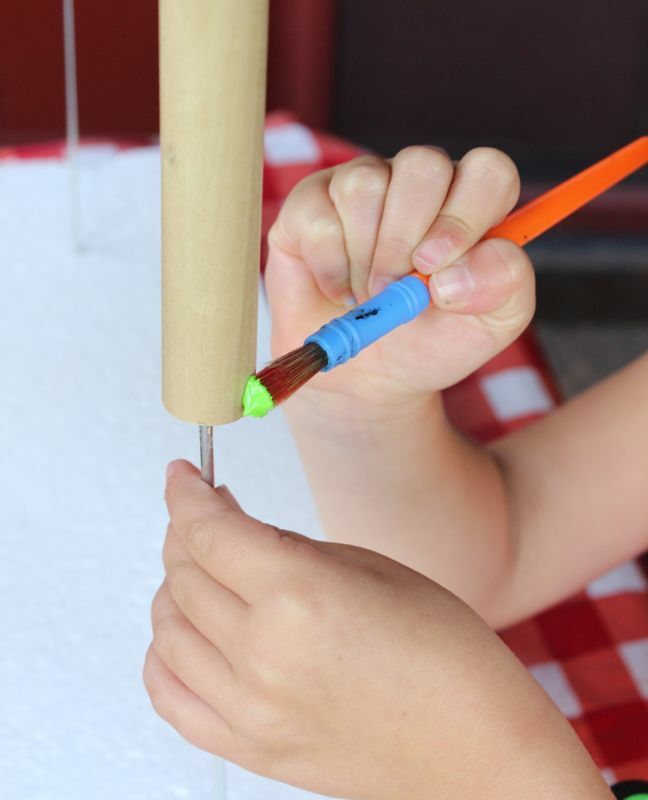 Promptly wipe away any excess glue. 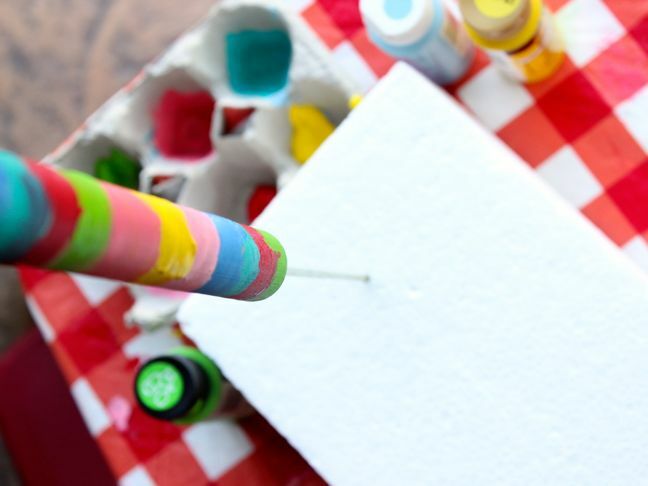 Step 4: Insert the skewer face down into a piece of Styrofoam, or something that will hold it in place while the kids paint without poking them in the eye. 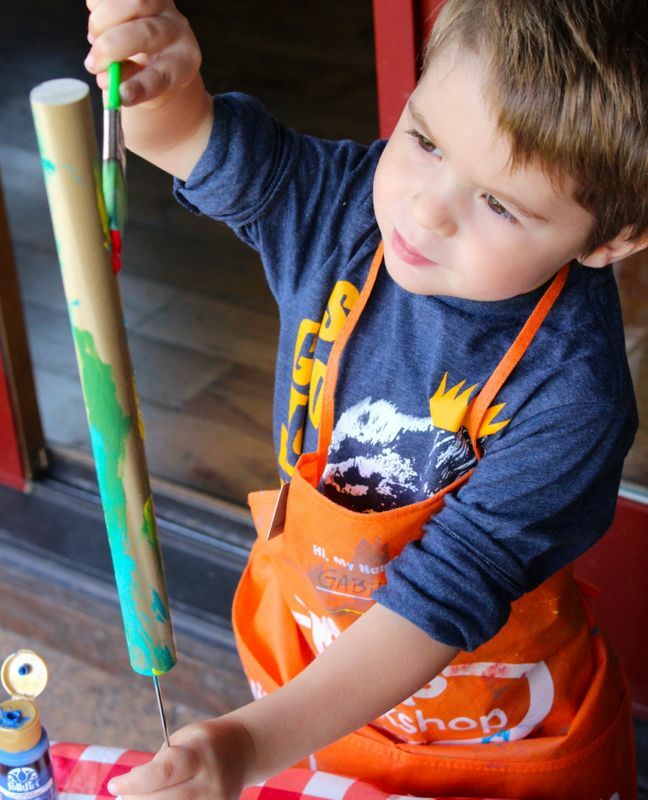 Step 5: Set up a paint station for the kids with aprons, paintbrushes, and paint so they can paint, paint, paint. 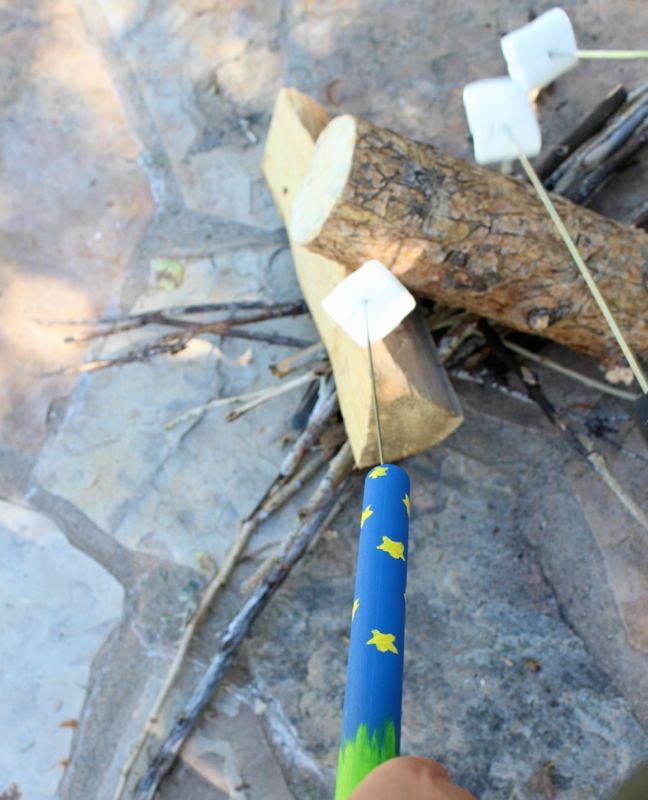 Step 6: Every stick needs its inaugural “roast” in the fire, so after the paint has dried, be sure to light up the fire pit and roast s’mores by the fire. To ensure the safety of all kids involved, we role-played with a pretend fire before we lit up the real thing when Daddy got home. 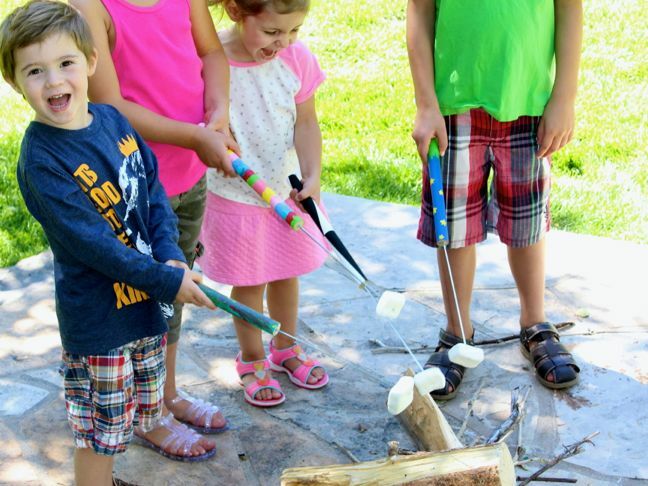 They had just as much fun, and even pretended to blow out the fire from the marshmallow after removing it from the fire pit. Step 7: Now give me some more of that s’more!